Home » Blog » HAPPY THANKSGIVING!!!!!!! 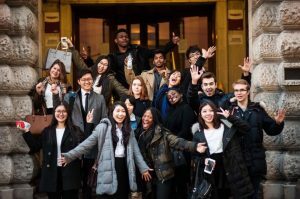 CLR Education Consulting wants to reach and say “thank you” to you for supporting us this past year as we worked together to help our U.S students achieve placements at their desired universities with great scholarships! May this years’ thanksgiving be filled with so much Joy, Love and Happiness! Our special shout-out to Tosin, Dupe, Subomi, Sophia, Omon, Ada and Osose. Girls you all did great jobs at your studies & referrals at our USA routes this year. Thanks for your support!! What’s on our thanksgiving plate? University of North Texas, Texas A & M Corpus Christi, Oglethorpe University Atlanta, Baylor University Texas, University of Rhode Island, Lynn university Florida, University of Vermont, Merrimack College Boston, James Madison University Virginia, ONCampus Cal at the University of California Monterey Bay, OnCampus Boston at the Wheelock College and a lot more.